Designed with both entertaining and relaxation and luxury style. 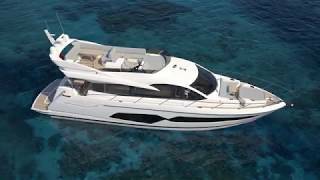 This wonderful hand-crafted flybridge model , offers her in Marina IBIZA .This four stateroom design is unmatched in terms of refinement, performance, interior layout, overall volume and sophistication. The Manhattan 66 was designed for entertaining and relaxation, therefore entertainment options with exceptional panoramic hull and saloon windows were important emphasis of the new model. One Masster Cabine ENSUITE, One VIP cabin ENSUITE, 2 twins cabins with one bathroom - one crew cabin. She is berthed in of the best zone of Marina Ibiza, near LIO cabaret, the boutiques and restaurants , with an amazing view to Dalt Vila.